Context - Forests cover a third of our planet's land. They provide raw materials, maintain biodiversity, protect land and water resources, and play a role in climate change mitigation. Forests are heavily exploited, but important efforts are being made to use and manage them more sustainably. What is the current state of the world's forests? The world’s forests fulfill many roles such as providing renewable raw materials and energy, maintaining biodiversity, and protecting land and water resources. However, they can be damaged by fire, agricultural and urban expansion, and other disturbances. 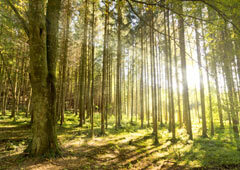 The 2005 Forest Resource Assessment is the most comprehensive assessment of forests to date, in terms of both content and number of contributors. It tells us that forests cover 30% of the land area of planet Earth and range from undisturbed primary forests to forests managed and used for a variety of purposes. The assessment also tells us that deforestation continues at an alarmingly high rate, but that the net loss of forest area is slowing down thanks to forest planting, landscape restoration and natural expansion of forests on abandoned land. Forests are increasingly being conserved and managed for multiple uses and values. They play a crucial role in climate change mitigation and in the conservation of biodiversity as well as of soil and water resources. If managed sustainably, forests also contribute significantly to local and national economies and to the well-being of current and future generations. The assessment of progress towards sustainable forest management depends on the context, the scale and the perspective applied. At the global level, the world’s forest resources appear to be in relatively good shape. However, at regional and subregional level, this picture changes dramatically revealing considerable differences, with alarming trends in several tropical subregions.